The particle in a box. where is the mass of the particle, is its total energy and is Planck’s constant. The number corresponding to the energy level is called the quantum number of . Wave-particle duality is a central concept in quantum mechanics. The fact that the energy spectrum is discrete, ie that not all energies are permitted, and in particular that zero energy is not permitted, are results you don't get out of classical mechanics — in fact, they fly in the face of conventional wisdom, which holds that quantities such as energy should vary continuously: "nature does not make jumps" according to Gottfried Leibniz. Classical physics also tells us that the lowest energy state of a system (also called the ground state or the vacuum) should have zero energy. But these strange quantum results tally with the experimental observations of quantum systems, for example the discrete energy spectrum of the hydrogen atom. The particle in a box: the position of the particle is shown on the x-axis and the energy on the y-axis. The permitted energy levels for the first four quantum numbers are shown as horizontal dotted lines. 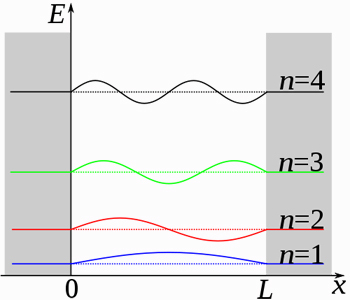 The wavefunctions are shown superimposed on the diagram at the corresponding energies. Image: Papa November. Since is the probability density of finding the particle at the point , this means that there are places in the box where the particle can never be found! Planck’s constant is very small, So for a large object, and will be comparatively huge. This means that will be so incredibly small that an object with energy becomes indistinguishable from one at rest. This is why in the macroscopic world a zero energy level does appear to be possible. As the mass and the size of the box get large, this difference tends to zero. So for large objects the permitted energy levels are so close together that it’s impossible to distinguish them from the energy levels that are not permitted — the energy level appears to vary continuously. Quantum tunneling: The vertical axis shows the potential energy of the particle, which is equal to V0 for x greater than 0 and less than L and zero elsewhere. It turns out that in quantum mechanics the particle can make it to the top, and even the other side, of the "potential hill" even if its energy is less than . We won’t go into the details here but solving Schrödinger’s equation (assuming ) with suitable boundary conditions gives a wave function that is non-zero on the entire -axis. This means that a particle coming from the left actually has a non-zero probability of being found inside the barrier and even to the right of it. There is a small but non-zero probability that the particle will tunnel through the barrier to the other side, even though in classical terms it does not have enough energy to do so. As you would expect, this probability becomes smaller the thicker the barrier, that is, the larger the value of . Generally the term quantum tunneling refers to any situation in which a particle overcomes a potential barrier that it should not be able to overcome according to classical physics. Quantum tunneling does occur in nature, for example in when uranium decays to thorium in a form of radioactive decay known as alpha decay. Here the atomic nucleus emits an alpha particle (which consists of two protons and two neutrons and is structurally identical to a helium nucleus). According to classical physics, the process of emitting the particle should be impossible, as it requires more energy than the atom has available. It's through quantum tunneling that the atom accomplishes the feat. The big question raised by all this mathematics is what Schrödinger's equation tells us about physical reality. How should we interpret its solution, the wave function? This is what we'll explore in the third article. Read the final article Schrödinger's equation, what does it mean? Marianne Freiberger is Editor of Plus. She would like to thank Jeremy Butterfield, a philosopher of physics, Nazim Bouatta, a Postdoctoral Fellow in Foundations of Physics, and Tony Short, a Royal Society Research Fellow in Foundations of Quantum Physics, all at the University of Cambridge, for their help in writing these articles. This is a wonderful site and content. All students of math and physics should read this kind of material. Many thanks! Keep up the good work!! Schrödinger's equation, what does it mean? Too many articles just go through the derivation of Schrodinger's Equation. Is it possible that h/2 is the fundamental quantum size? If we define a new Planck's constant (call it hs) such that hs = h/2, and plug that into the Schroedinger Equation, does that change the usefulness of the equation (or add any other complications to any aspect of physical laws or quantum mechanics)? I have a reason for asking that, which we can discuss if your answer is no. Interesting thought, perhaps even 1/4 ? I am interested in discussing this.